Date: Sunday 26th August @ The Strand, Attenborough - match starts @ 2.00pm. The squad has now been selected and the brass band booked! 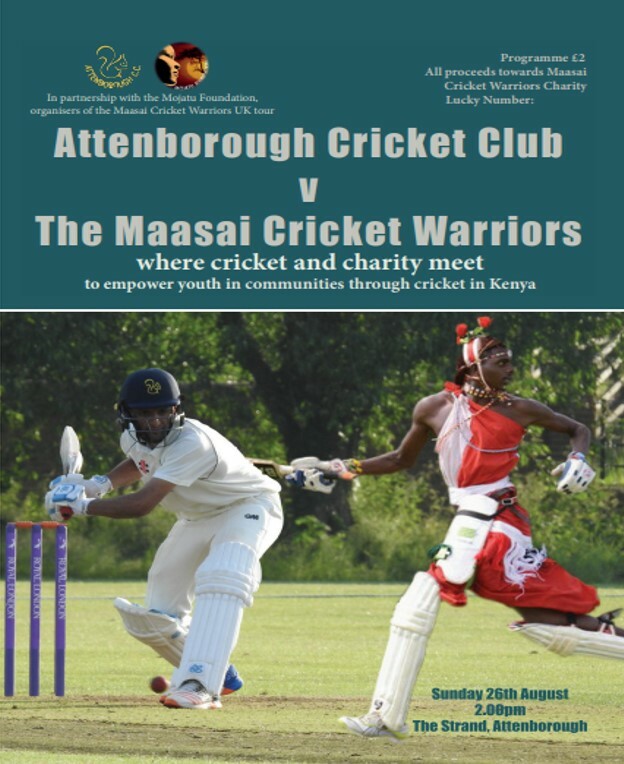 We now look forward to welcoming the Maasai Cricket Warriors from Kenya to Attenborough Cricket Club, helping the Maasai's to raise funds for worthy causes in their homeland. The full match day schedule can be found here. The day promises to be packed with fun and excitement, with the Warriors enjoying their cricket, playing in their national costume. If arriving by car then we have parking available in the church field at the corner of The Strand or around the boundary near to the cricket nets at the far end of the pitch. Stewards will be on hand to help with directions. To keep vehicles in the area to a minimum on the day, if you are able to walk to the ground that would be very helpful. We shall have a BBQ available from 1.00pm and the bar will be open at a similar time. Refreshments and a selection of cakes will be available to buy throughout the day. We are also very pleased to advise that the Long Eaton Silver Prize Brass Band will be playing at the tea interval (around 3.30pm) and will also provide a Musical Finale at the end of the match. Our friends and sponsors from 'Owzat Cricket' will also be joining in the fun on the day, bringing along some samples of cricket kit/wear etc to view..
To help with the Maasai fundraising, we ask that spectators buy a match day programme (£2) which will be on sale (with a lucky number prize), at the ground. Amongst other things, this programme explains the work of the Maasai's in greater detail. 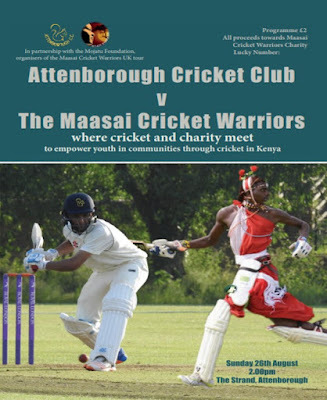 During the afternoon there will be a raffle, with proceeds going towards the Maasai Cricket Warriors fundraising goals. This is a high profile 'whole of club' event. We welcome the support from the senior and youth sections of our club, friends and families - together with inviting those from the local community to also enjoy the cricket within our beautiful club facilities and surroundings. We look forward to seeing you all there. Let's hope that the weather is good so that we can all enjoy the cricket, together with the planned activities.